The maintenanve section is a guide to equipment care. Use the service hour meter to determine servicing intervas.Calendar intervals shown (daily , weekly , month , etc.) can be used instead of service hour meter intervals if they provide more convenient schedules and approximate the indicated service hour meter reading. Recommended service should always be performed at the interval that occurs first. 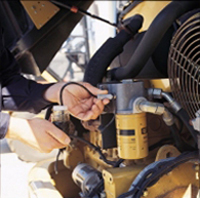 Under extremely severs,dusty or wet operatin conditions, more frequent lubrication than is specified in the maintenance intervals chart might be necessary. Perform service on item at multiples of the original requirement. For example , at every 500 service hours or 3 months , also service those items listed under every 250 service hour or monthly and every 10 service hours or daily.